So I have have spent the last few months buried under a pile of never ending washing that newborns seem to bring with them. Which has resulted in very little blogging... prior to that I was in a pit of depression about my SPD/PGP (post on that to come...). 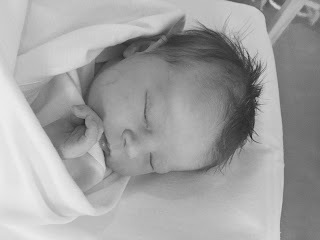 Most importantly, I now have a gorgeous baby girl, Camille. Seb is being a wonderful big brother and absolutely adores her... admittedly she isn't trying to nab his toys yet... so I'm sure we have all that fun to come! 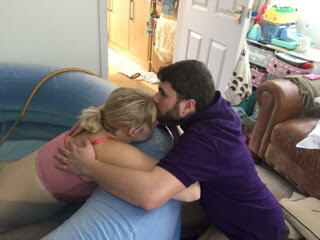 I had an absolutely amazingly perfect home birth. It was everything I hoped for. When I woke in the night for the third time, I realised that the pain I was feeling wasn't just SPD pain but in fact was the start of contractions, I remained calm though inside was bouncing up and down with excitement... my little girl was on her way! I managed, to his delight, not to wake the husband until 4am and that was only to let him know that I was in labour. He went back to sleep for a while after that whilst I listened to my Natal Hypnotherapy in a bid to continue to rest and get myself in the right frame of mind. 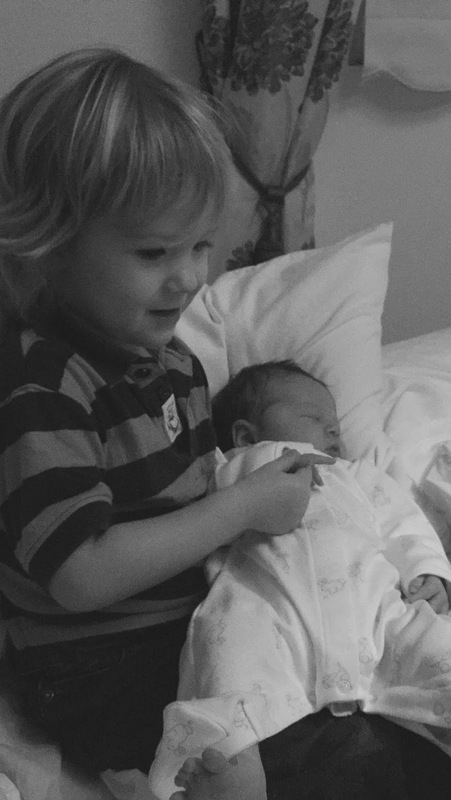 My midwife arrived in the early morning and Seb woke up. We packaged him off to next door and Mr NQP set the pool up in the living room. At this point the contractions were still all over the place and not particularly strong. I found, unlike my first labour, that I was most comfortable lying down. 'Do what your body tells you!' my midwife reminded me. So off we went to bed... I think we watched some friends episodes while everyone left us to stay in the calm. It wasn't long before they ramped up a gear and Friends just wasn't cutting it anymore! My midwife came back and upon seeing a contraction suggested maybe I should get in the pool! The pool was absolute bliss, so incredibly relaxing and just so comforting to be in my own home with the people I had chosen around me. 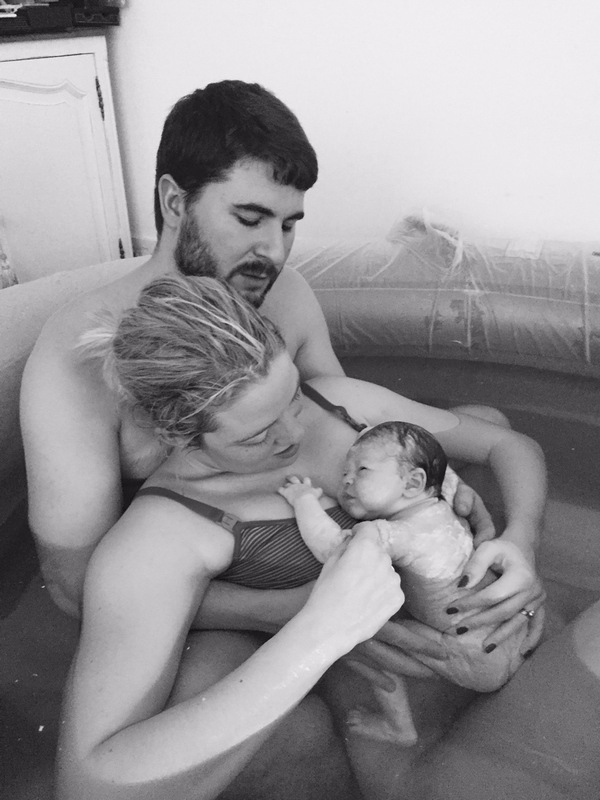 As it was a home birth I was able to have loads of people, so as well as my husband and midwife, by the time I was in the pool I also had my mother, mother in law and just in time to see the delivery, my sister in law. Established labour for just three hours and my beautiful vernix covered baby arrived safe and sound. I had opted for a physiological third stage, this means no immediate injection of oxytocin to encourage the uterus to contract. I also had wanted delayed cord clamping but as the cord was fairly short and we were in water, after 10 minutes I asked for it to be cut as I was finding it hard to not drop Camille back under the water! A few moments later I had the urge to push, the placenta was delivered and unfortunately it was all downhill from there. I suffered a post partum haemorrhage and lost an estimated litre and a half of blood. However, if anything, this shows how safe home births can be. My dream team were quick to action and I was got carefully out of the pool and laid on the floor. The lovely, doting Grannies took Camille to dry and dress her and I was given synthetic oxytocin to stem the bleeding. An ambulance was called to get me to hospital. By the time the fabulous paramedics arrived, I'm told the bleeding was under control and they calmly took me off to hospital for fluids. I was fairly dozey throughout this, I felt very safe with my dream team, but a little like I was watching from the outside. I think at one point I asked if there was anything I could do, but was told fairly firmly just to lie still! Once in hospital, I was well looked after by some lovely doctors and midwives, given some fluids and more syntocinon via IV to ensure the bleeding had well and truly stopped and had some clots removed, this was by far the worst part of the whole process and the only thing I needed gas and air for! This whole process, though entirely necessary, was a little gutting as it meant I then had to spend the night in hospital which is what I was desperately trying to avoid! Camille was brought in by my mother in law and sister in law and I had a little cry as I saw her for the first time since the birth a few hours before. We shared lots of hugs and I fed her for the first time. When we were eventually discharged from hospital the next afternoon armed with iron tablets and a promise to take it easy. We took our little Camille home to meet her big brother. The next couple of weeks were pretty tough, she was an absolute trouper but I found my continuing bed boundness (not a word...) extremely frustrating. But with very low iron, I really needed to rest. I was so sick of bed already but this was the only way I was going to get better! I am incredibly lucky to have an incredibly supportive family, especially my husband. He was an absolute rock during labour, always doing the right thing at the right time and remaining remarkably calm, even at a time that was more than a little scary for him. So a huge thank you to him and all the family for their marvellous love and support. So here she is at 16 weeks (oh my goodness, where does the time go) and she is an absolute angel. The smiliest girl I know and absolutely perfect (I promise, I'm not biased...) I hope to carry on giving you some insights into parenting, how I see it, my top tips both as a nanny and as a mother and hopefully some giggles along the way.